East Midlands Councils has published a major new report which highlights how the East Midlands is vulnerable to small changes in climate which could double the number of people at ‘significant risk’ of flooding. It highlights 16 recommendations aimed at Government, councils and business groups to reduce the impacts of flooding on local people and businesses. 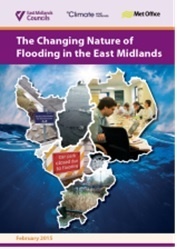 The report, entitled 'The Changing of Nature of Flooding in the East Midlands', has been published by East Midlands Councils with support from Climate East Midlands and research specially commissioned from the Met Office. The report notes the existing vulnerability of 20% of the land area of the East Midlands to flooding from the sea, rivers and surface water. It also highlights that a 10% increase in peak river flow would potentially double the number of residential properties at ‘significant risk’ of flooding from 30,000 to 60,000. The East Midlands has a significant area of land at risk of flooding: 20% of the region is within Flood Zone 21 for fluvial and coastal flooding, with over 200,000 properties and over 400,000 people living in flood risk areas2. An independent review by the Met Office has concluded that, based on the proportion of people at risk, the East Midlands region has the highest exposure to increases in flood risk due to climate change in England. The region’s vulnerability has also been highlighted in the Environment Agency’s National Flood Risk Assessment and by the Government’s independent advisors, the Committee on Climate Change. The East Midlands is highly vulnerable to coastal flooding, due to large areas of low lying land along the Lincolnshire coastline, river flooding and surface water flooding. A 10% increase in peak flow in the East Midland’s rivers would potentially double the number of residential properties at ‘significant risk’3 of flooding from around 30,000 to 60,000 properties. Ensuring that local and national partnerships are strengthened and continue to work effectively before, during and after extreme weather events when flooding results. The report goes on to make a number of recommendations for Government, councils and business organisations.